The brachioradialis (G. brachion, arm. 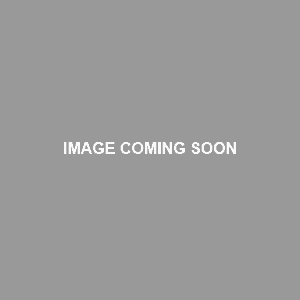 L. radius, stake or rod [shape of radius bone]) is a large forearm muscle, whose name refers to its connection between the upper arm and radius. …But unlike the wrist extensors, the brachioradialis is mostly visible from the anterior and lateral sides of the forearm, as opposed to posterior side. And it doesn’t act on the wrist or digits, either. Rather, it’s main action is elbow flexion, though it is weak compared the brachialis and (depending on forearm rotation) biceps brachii. It is strongest in elbow flexion when the forearm is mid-prone. It is slightly weaker when the forearm is pronated, but it receives more activation because the biceps brachii is mostly inhibited in this position. It is weakest and least activated when the forearm is supinated. Despite being a relatively small muscle, a well-developed brachioradialis muscle is essential for overall arm aesthetics. It gives you a thick upper-outer forearm, which “ties in” to the brachialis and long head of the triceps on the lower-outer part of the upper arm. It lies superficial to the pronator teres. From an anterior view with the forearm in anatomical position, it medial to the extensor carpi radialis longus and lateral to the flexor carpi radialis. The brachioradialis arises from outside of the distal humerus. Its parallel-oriented fibers create a fusiform muscle shape as they run down forearm and insert near the thumb-side of the wrist on the radius. Note: The table below includes just the exercises that target the brachioradialis directly. Exercises that train the brachioradialis indirectly include any back exercises involving elbow flexion with a neutral or pronated grip (see lat exercises and middle trapezius/rhomboid exercises). Overactive/Short Brachioradialis: The brachioradialis can become overactive and short due to overuse. This can be caused by training the muscle excessively in your workout routine, or by doing too much of any repetitive activity involving elbow flexion with a neutral or pronated forearm (e.g. rock climbing or hammering nails). This increases the likelihood of straining the brachioradialis, especially under heavier loads. For example, it’s not uncommon to hear of someone getting a brachioradialis strain during weighted neutral grip chin ups or heavy hammer curls. Don’t do any direct brachioradialis exercises. If you do dumbbell curls for biceps training, keep your forearms supinated throughout the entire range of motion; don’t turn them to neutral at the bottom of the rep. If possible, reduce any repetitive activity involving the brachioradialis that you may be doing throughout the day (e.g. hammering nails if you’re a carpenter; rock climbing if this is your sport). 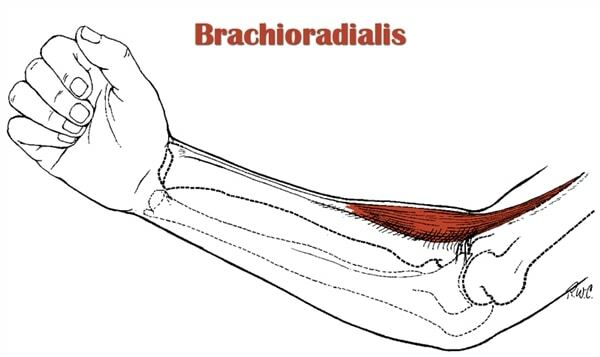 Release and stretch your brachioradialis. Do the same for the other major elbow flexors – namely the biceps brachii and brachialis – since they are likely tight as well. For best results, do this daily and before any workouts involving back or biceps training. If you also have overactive/short biceps brachii and brachialis, this suggests the presence of triceps brachii weakness. Assuming this is the case, you should increase your training volume for triceps and/or reduce your training volume for the biceps/brachialis. Implement direct brachioradialis exercises into your training if you aren’t currently doing so. If you’re already doing this, then increase your training volume by a few more sets per week. Consider substituting a neutral grip or pronated grip for an underhand grip on back exercises involving elbow flexion (e.g. do neutral grip chin ups or pull ups instead of chin ups; do neutral grip t-bar rows or overhand barbell rows instead of underhand barbell rows). To make the brachioradialis really look good, it’s important to train a muscle called the extensor carpi radialis longus. It runs right next to the brachioradialis and can easily be mistaken as being part of it. It is a wrist extensor, so any variation (e.g. dumbbell reverse wrist curl, wrist roller) will train this muscle.